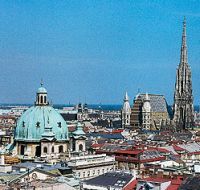 Austria is to follow Germany and introduce what it calls an "ecological air travel levy" similar to Germany’s new tax scheme due to be effective 1 January 2011. Passengers boarding flights in Austria will be charged €8 for European flights and €40 for long haul flights. 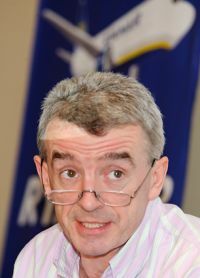 The tax is expected to raise €60m in 2011 rising to €90m in successive years. Blackberry users can now take a step into the future and board British Airways flights using the airline’s new Mobile Boarding Passes (MBP). The MBP can be used when customers travel on any British Airways operated domestic flight and to many European destinations. Users of Android-operated mobile smartphones will also benefit from the new functionality following its successful launch to iPhone users in July. 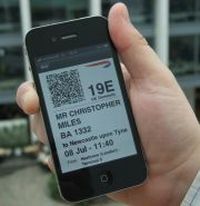 Over 30,000 customers have used the Mobile Boarding Pass on their iPhones to fly on BA flights since it was introduced. British Airways was the first airline to develop an App for customers in the UK. The App ensures customers have access to real time flight information about their upcoming trips, full integration with their Executive Club details and easily and smoothly guide customers through each stage of their flight process. It also provides a dedicated travel news section, frequently asked questions and a link to BA's website. Airbus has confirmed that Hong Kong Airlines, partially owned by the independent Beijing-based carrier Hainan Airways, has finalised a contract with Airbus covering the firm order of ten more A330-200 long range aircraft and converted an existing order for 15 A330s to the A350 XWB. Aer Lingus has confirmed an entirely new three times weekly service between Shannon and Paris Charles de Gaulle, commencing on 17 December 2010. The introduction of the Paris route brings to eight the total number of destinations served by Aer Lingus from Shannon Airport, with up to 59 flights per week available on flights to Heathrow, Paris, New York and Boston, and Aer Lingus Regional services to Birmingham, Bristol, Glasgow and Manchester. 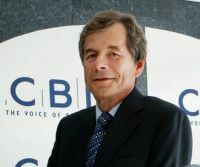 Martin Broughton, Chairman of British Airways, gave vent to his feelings regarding airline security when asked a question at the CBI Conference last week. It could not be confirmed but it might be that he, the most senior man at BA, had been put through a frustrating time when recently passing through an airport. Mr Broughton said many of the checks were "completely redundant" and added that the UK should stop "kowtowing" to US security demands. Transport Secretary Philip Hammond quickly signalled his willingness to change the regulations on security checks at British airports. However the rules are not set by Westminster in this case, but by Brussels. American Airlines, British Airways and Iberia have launched a transatlantic joint venture including new routes, codeshare agreements on over 2,600 services, and the rescheduling of key flights between London and JFK. Members of all three frequent flyer schemes can now earn and redeem miles on eligible routes, and also have the ability to mix and match outbound and return fares from the carriers. For the first time BA and AA will also open their Arrivals lounges at Heathrow T3 and T5 to all oneworld Emerald status cardholders landing on either airlines’ flights. AA’s CEO Gerard Arpey said that the new schedules, which take effect for the summer 2011 season, would allow for “virtually an hourly service” between London and New York. Schedules between London and Chicago will be similarly adjusted. 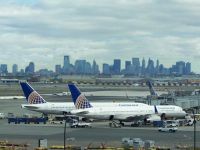 United Continental - Holdings Inc, the world’s largest airline, has announced plans to launch services on several new non-stop routes in 2011 as it begins to optimize the combined route networks of United Airlines and Continental Airlines. Continental, as already noted in AERBT, went to a five times daily service from Heathrow to Newark-New York yesterday. Continental will add new flights between Houston and Bakersfield and Palm Springs, California; Cedar Rapids, Iowa; Grand Junction, Colorado; Hobbs, New Mexico; Reno, Nevada, and Montreal (Canada). From Cleveland Hopkins International, Continental will begin services to Cincinnati, Ohio, and from Newark-New York the carrier will begin flights to Des Moines, Iowa. Mike Ambrose has led the ERA since 1987. 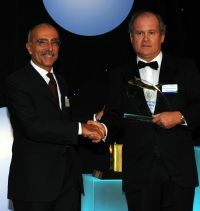 Mike's career began in Flight Operations at British European Airways in 1966. 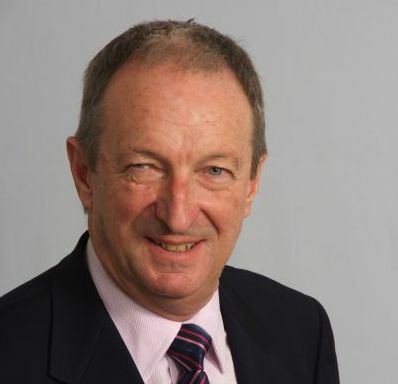 In 1974 he transferred to British Airways' Regional Division where he was responsible for aircraft evaluation and fleet procurement and held other various assignments within the airline. For a long time now, ERA has advocated the requirement for better regulatory procedures; poor regulation is often the primary cause of unnecessary cost burdens on airlines. 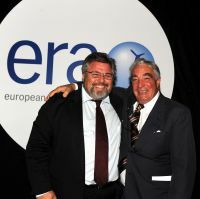 With the onset of the financial crisis at the end of 2008, this issue has become even more important for airlines and one of ERA’s top priorities. The European Commission has produced its own excellent principles for good governance which define good practice for use by all regulators and service providers. They are based on business principles and common sense. However, in spite of the blaze of publicity in which these principles are often promoted, in practice they are poorly applied. The development of the Air Accident Investigation Regulation, soon to become law, is a case in point. An agreement was made between the European Commission, European Parliament and European Council of Ministers behind doors which were effectively closed to all stakeholders. There was no opportunity for consultation and much of the documentation was unavailable for stakeholders to comment on. This method of fast-tracking regulation, known as the ‘Trilogue’ process, is becoming more commonplace, although it is the first time we have experienced it in air transport. The Regulation could be interpreted to require airlines to fund psychological counselling for all passengers involved in an accident, together with their relatives, with no time limit. Undoubtedly, there will be referrals to the European Court of Justice to obtain a common understanding. So airlines may be burdened with an unlimited liability which is applied to no other mode of transport. If this sounds familiar, then that’s because it is! Ironically, while the Accident Investigation Trilogue process was taking place behind closed doors, airlines were publicly suffering under the unlimited liability for the provision of passenger care imposed on them by Regulation 261/2004 as a result of the Icelandic volcano eruption. Ironically, both the Commission and the EU’s transport ministers suggested this burden should be alleviated, while at the same time agreeing this new law. So, it would seem no lessons have been learned. Another example of poor application of the European Commission’s “smart regulation” principles is the inclusion of aviation in the EU Emissions Trading Scheme. The EC’s consultants who conducted the impact assessment were not obliged to consult with industry experts. DGENV, the department within the European Commission which is responsible for environmental issues, wrote proposals without sharing their ideas with stakeholders. There was no partnership consultation throughout the process which results in loss of face when changes are proposed by industry stakeholders. There is a reason why stakeholder consultation is important, and it has little to do with democracy. Industry stakeholders have extensive knowledge and experience of the industry they work in, and as such they are able to provide expert advice on the best workable solution. Although it has happened on occasions in the past, Regulators generally do not deliberately insert detrimental clauses into the laws they make. Harmful elements are more likely to be introduced unwittingly, or simply go unnoticed, because the Regulators do not have the expert knowledge required to realise all the effects of their input. Regrettably, they rarely go unnoticed by the lawyers who are the main benefactors of poor regulation, as they attempt to unravel the Regulators’ tangled rules. Lack of appropriate consultation is a problem, but it is not the only one. The current regulatory process allows no provision for the ‘final’ legislation to be evaluated before it is adopted. More than 1,100 proposed amendments to the ETS legislation were handled in one day by the European Parliament, none of which was assessed. In the case of Regulation 261 on passenger compensation, this was agreed in the Conciliation process which occurs behind closed doors with no possibility of amendment once the doors are re-opened. The very fact that a law cannot be agreed upon easily by all parties is a significant clue that it may be unworkable. Changes at all stages of the legislative process must be fully evaluated for both practicality and financial impact, and this must be done with the involvement of experts. Air transport is a key enabler for social and economic growth, and this is particularly important for the regions of Europe. However, airlines can no longer financially sustain this regime of poor regulation. 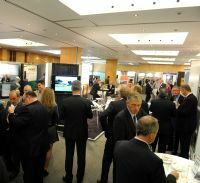 It is now becoming a question of survival as the industry is becoming less and less attractive to potential investors. Philip Hammond, UK Secretary of State for Transport, in his first significant speech to the airline industry since his appointment five months ago, has announced an aviation policy review. He said he hoped to publish a draft policy document for formal consultation early in 2012. Full publication is not likely until the end of that year. 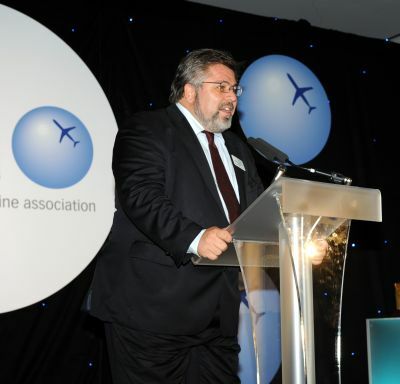 Mr Hammond was speaking at the Airport Operators Association (AOA) conference. One wit noted that his remarks were straight out of Yes Minister. The Board of Airline Representatives in the UK (BAR UK) was quick to say it had serious concerns that the planned time scales involved would do nothing to address the urgency of the situation. 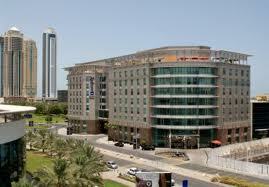 Rezidor Hotel Group has confirmed the Radisson Blu Hotel, Dubai Downtown. The property, featuring 220 rooms, is scheduled to open in early 2011. It is Rezidor’s fourth Radisson Blu Hotel in the Emirate, joining the Radisson Blu Hotel, Dubai Deira Creek, the Radisson Blu Residence, Dubai Marina, and the Radisson Blu Hotel Dubai Media City. The new hotel will be located on the upper floors of a mixed existing building located within walking distance from Dubai Mall and 10km from the current international airport. It comprises 198 contemporary rooms and 22 suites all equipped with Radisson Blu signature services such as free high-speed internet access. Guests will also benefit from an all day dining-restaurant, a speciality restaurant, a pub, two bars (including a rooftop pool bar), and a Business Class Lounge. 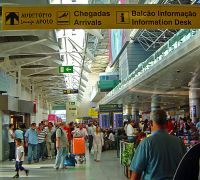 easyJet is to open a base at Lisbon, but not until the winter season 2011. Already the second largest airline in Portugal, the carrier will add to its 15 existing routes to connect the country’s capital city to up to ten new European leisure and business destinations. The base, which will be the home for up to seven Airbus A319 aircraft, will be the airline’s 20th in Europe and enables further expansion, the development of new routes, and the provision of improved service to customers. Air France is to start operating a three times per week service between Paris-Charles de Gaulle and Phnom Penh, the Cambodian capital, starting 27 March 2011. The French influence is paramount in the city, Cambodia a protectorate of France from 1863 to 1953. The flights, which will go via Bangkok, will be initially operated by an Airbus A340-300 equipped with 275 seats (30 in Business, 21 in Premium Voyageur and 224 in Voyageur-Economy). Subsequently for the summer season 2011 the Airbus will be replaced by a Boeing 777-300ER equipped with 309 seats (35 in Business, 24 in Premium Voyageur and 250 in Voyageur-Economy). Aerolíneas Argentinas, the nationalised flag carrier of Argentina, has signed an agreement to officially start the process of joining SkyTeam as the first South American member of the airline alliance. A target date for 2012 has been set. Through a five-year restructuring plan introduced last year, Aerolíneas Argentinas is implementing a number of measures to strengthen its business model and establish itself as a major player in the region. Key elements of this plan include fleet renewal and rationalization, adding key international destinations, increasing the density of the domestic and regional network and improving product quality and consistency. 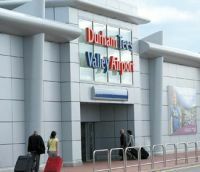 Durham Tees Valley Airport (which used to be known as Teesside) is to introduce a direct passenger handling fee of £6, with a £2 charge for children between the ages of 3 and 15. A similar scheme is already in place at Blackpool, Newquay and Norwich, and Knock and Galway in Ireland. Also announced last week is a £1 drop-off charge at Edinburgh Airport. Durham Tees, is owned 75% by Peel Airports Ltd with the balance in the hands of the local authorities. Peel itself also runs Liverpool and Doncaster airports plus Barton Manchester, recently renamed City Airport. This is an executive and general aviation operation. Peel Airports itself is now owned by the Peel Group plc (35%) with its partner Vancouver Airport Services (65%). Manchester Airport now has body scanners in use in all its security search areas just 12 months after their provisional introduction. The airport says there has been an overwhelmingly positive reception from passengers. Results of extensive passenger surveys following a voluntary trial in Terminal 2 in October 2009 reveals that over 95% of travellers consistently rate the body scanner process to be a significant improvement on the traditional airport security pat down. Passengers are allowed to keep their coats, jackets and shoes on. 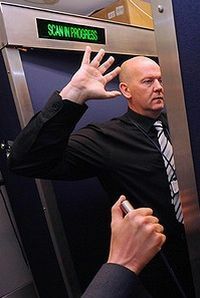 Body scanners have also slashed security queues. Replacing personal inspection with this technology has meant a dramatic reduction in the amount of time each passenger spends being security screened. It makes life easier for the staff too. British Airways and Iberia, the two companies that will make up International Airlines Group, both made profits during the last quarter, a turnaround in each case. With BA the figure was £158m (2009 £292m) whilst Iberia came up with €53 (2009 loss €182m). BA will not pay a dividend this quarter but passenger revenue was up by 7.9% and capacity down by 6.2%. Revenue in cargo increased by a dramatic 39.4%, driven by yields recovering from the market low point of last year. 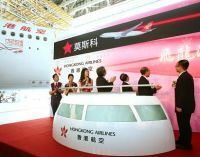 The airline noted that by year end 12 aircraft will have been fitted with the new First cabin. The initial two Boeing 777-300ER aircraft – with revamped cabins and in-flight entertainment – are now in operation with the third scheduled to enter service next month. Aberdeen-based travellers (and those inbound) now have an alternative to the Middle East and beyond following the signing of an agreement between Emirates Airline and Eastern Airways linking Aberdeen and Newcastle. Aberdeen is Eastern Airways’ largest base with services to 15 destinations, while Newcastle is also a key hub for the UK airline. All passengers travelling with Eastern Airways are able to use the dedicated fast track security channels when departing from Aberdeen and Newcastle airports. Eastern Airways’ 11:00 departure (T3 4035) from Aberdeen arrives in Newcastle at 11:55, where it connects with Emirates’ daily flight to Dubai (EK 036) at 13:10. The Emirates service from Dubai (EK 035) arrives at Newcastle at 11:40, connecting with the return Eastern Airways service to Aberdeen (T3 4036) which departs at 13:30. Hilton Worldwide is to open three new hotels at strategic regional locations in Russia. The new properties will open in Yaroslavl and Kazan, as well as Hilton Worldwide's second hotel in Moscow. 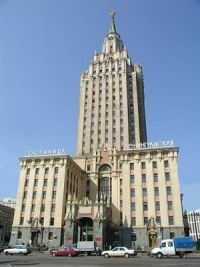 These new signings will significantly expand the group's presence in Russia, with 11 hotels now open or under development. The Doubletree by Hilton, Moscow Leningradsky-Riverside – will offer 270 rooms. The hotel is expected to open in the beginning of 2012. A yacht club and marina is located next to the hotel site. At Yaroslavl, a UNESCO world heritage site, the Hilton Garden Inn is planned with 179 guestrooms close by the Moscovsky railway station and the main city highway, which connects Yaroslavl to Moscow (250 km). It is expected to open in spring 2012. Marseille Airport is to lose Ryanair after the Irish airline stood its ground and refused to bow to pressure regarding its work practices. In what was seen as a final move on some sort of reconciliation CEO Michael O’Leary went to the French port city to make the announcement. The base with its four aircraft will close on 11 January. The airline says that the operation and its flight crews fully comply with the European Directive on transport workers which allows all mobile staff to pay income tax and social insurance in the country they work (which in this case is Ireland because they work on Irish registered aircraft which is defined as Irish territory) or where their employer is resident and where they are physically paid, which also in Ryanair’s case is Ireland. The French authorities take a different view and claim that these mobile (Irish) workers should pay income tax and social insurance in France, rather than in Ireland, even though this is contrary to EU regulations. Ryanair will continue to operate ten routes to/from Marseille Airport, on aircraft and crews that are based elsewhere. 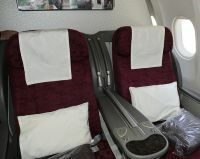 Qatar Airways is to launch a thrice weekly service between Stuttgart and Doha commencing on 9 March next year. It will be the first non-stop direct flights from the Gulf area to what is the centre of Germany’s motor industry. Due to licensing requirements no other carrier from the UAE can offer the service. 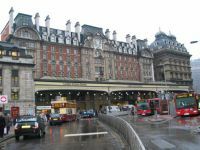 Avis UK has opened a branch at London Victoria train station. As part of the company’s ongoing expansion across the UK, this new facility will provide a convenient onward travel option for those visiting the capital. As one of London’s busiest transport hubs, bringing together both the mainline train terminal (with non-stop rail services to Gatwick), the Underground and the coach station, Victoria is a key gateway to the capital for visitors from outside the city. Direct bus services also serve Gatwick, Heathrow, Luton and Stansted airports.